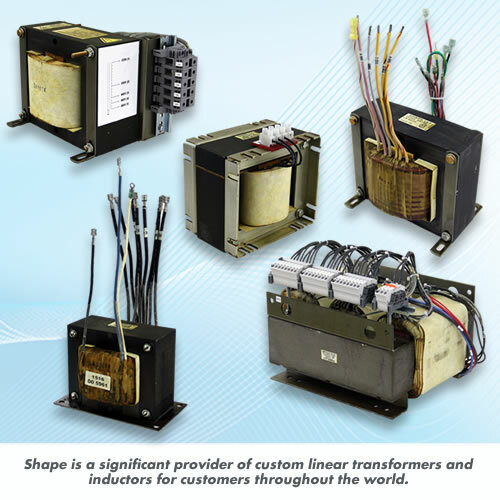 Shape has, and always will be, a significant provider of custom linear transformers and inductors for customers throughout the world, including many OEM’s who have very specific electrical and mechanical requirements. Our line includes isolation transformers, step-up transformers (and step-down transformers), filament, inverter, potential, buck/boost, current and autotransformers. Linear transformers, including alternating current (AC) operated transformers, which do not contain any electronics, help many of our customers convert energy, including those whose products must work in very harsh environments. Common applications include turbines, hydraulics, automated equipment, aircraft, and satellites. Shape also offers AC reactors, DC links, saturable reactors, high reactance transformers and chokes. Inductors are often used in electronic filters or tuned circuits. Chokes are very specific types of inductors that block, or decouple, higher-frequency alternating currents in an electrical circuit, while letting lower frequency (DC) currents pass. Coil-insulated wire is would around a magnetic core to create a choke. Linear transformers and inductors - just a few more reasons customers throughout the world turn to Shape for Innovative Transformer Solutions. Contact us today. You’ll see how quickly we can prototype a custom product for any and all of your unique applications.